Attack alert! 5 alien squadrons closing on Mother ship. You have 3 squadrons with which to defend her. 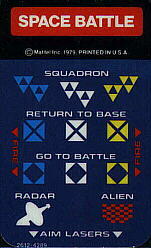 Check enemy positions on Radar Screen, then dispatch your squadrons. When they reach alien squadrons, GO TO BATTLE! Screen switches to Battle Screen. You move the gunsight to aim. You fire converging missiles. Watch out! The aliens shoot back. It´s you against computer-controlled invaders. Only you can save the Mother Ship from disaster.